Six golf courses. Villas with Deluxe Suites, Luxury Cottages. No matter what kind of golf experience you are looking for, Gull Lake View Golf Club & Resort has it waiting for you. Five courses are open with their sixth course, Stoatin Brae, opening in 2016. All within driving distance (no pun intended) of Kalamazoo. 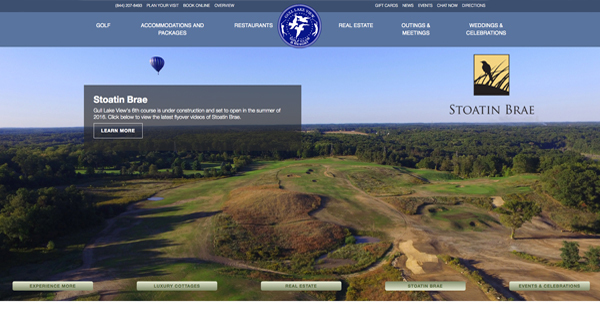 Gull Lake View asked us to redesign their website in 2015. The challenge was to design a site that allowed the user to easily find everything Gull Lake View has to offer. Our solution was to create an attractive site that showed off their beautiful landscapes and amenities without cluttering it up too much. Take a look. Heck, book a trip.